USC hit at a .317 clip and served up five aces in a home sweep of Oregon State on Thursday to move to 5-0 at the Galen Center and 4-1 in Pac-12 play. The Trojans outdid the Beavers 43-36 in kills, .317 to .152 in hitting efficiency and 5-1 in aces. OSU edged USC 5-4 in blocks. USC got better as the match went on, hitting .206 in the opening set, .314 in Set 2 and .429 in Set 3. Oregon State also improved throughout the match, going from a .068 starting effort to a .273 mark in the final stanza. Khalia Lanier notched a match-high 17 kills, while hitting at a .400 clip and serving up three aces. Brooke Botkin downed 15 kills and added nine digs, while Jasmine Gross added seven putdowns on a team-best .636 clip to go with three blocks. Maddie Goings paced the Beavers with 12 kills, nine digs and the team’s lone ace. Maddy Gravley and Amy Underdown chipped in nine putaways apiece. Gravley hit at a team-best .400 clip and put up four blocks. Oregon State led by as many as five in Set 1 at 10-5, including three Goings kills and two blocks. USC caught up, tying the score at 12 with four Beaver errors and two Botkin putaways. The Trojans took a brief lead at 14-13, but fell behind by three at 18-15. 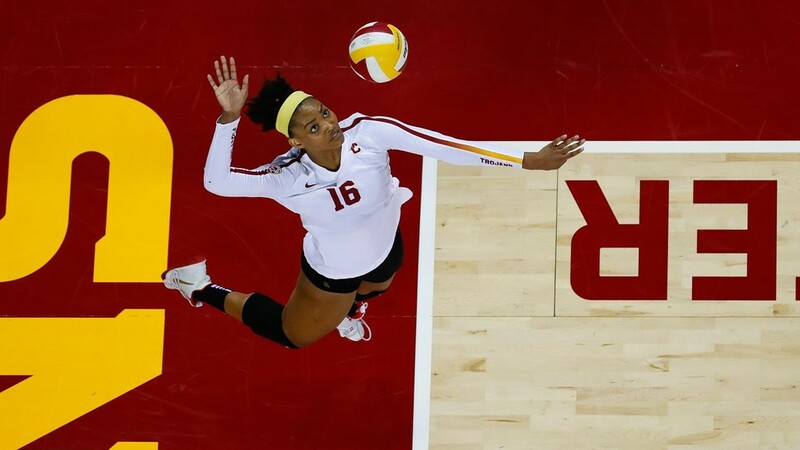 USC took over from there, scoring eight straight to go ahead 23-18 with help from two kills and a block by Gross. A service error gave the team its first set point try at 24-19 and a Botkin putaway two points late sealed the win. USC was the aggressor from the start in Set 2, racing out to a seven-point lead at 14-7. Botkin turned in three kills, while Reni Meyer-Whalley and Lanier served up aces and the Beavers made five errors. Two more Lanier putaways pushed the margin to nine at 17-8. The Beavers scored eight of the next 12 to pull within five at 21-16, but the Trojans answered with three straight, two on OSU errors, cut earn a set-point at 24-16. The Beavers stopped two tries, but succumbed to an Emily Baptista kill to fall 25-18. The teams split the first 18 points of Set 3, before USC pulled away with a 8-2 run, including two kills each by Gross and Lanier. Oregon State called timeout and scored three in a row to narrow the gap to three at 17-14, but would get no closer. Back-to-back kills by Lanier and a Botkin putaway put the Trojans on the hill for the match at 24-19. A Goings kill and a stuff by Gravley and Maddie Sheehan kept the Beavers alive momentarily, before Lanier issued the final blow at 25-21. USC welcomes #19 Oregon to the Galen Center for a 4 p.m. ET Sunday matchup. Oregon State is set to face #21 UCLA at 10 p.m. ET on Saturday.